We did not learn how to square the circle in school but if one takes geometry one will learn how to draw a square around a circle. 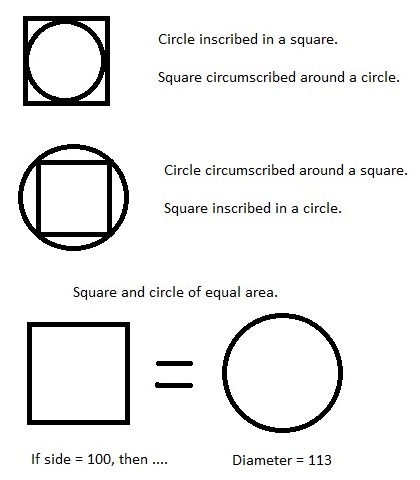 One might even learn how to draw a square within a circle. Other terms used in describing this are: the square circumscribed around a circle, converting the diameter of the circle into a square, the circle circumscribed around a square and a circle of equal area to a square, etc. These are Old World math problems that date back thousands of years. School lessons on clay tablets from Sumeria reveal students studied this topic hundreds of generations past. What do the terms mean? This is best shown in a picture. The Old World problem called squaring the circle. Anyone who has attempted to study gematria runs into this Old World problem. “Dimensions of Paradise” 2 which is John Michell’s study of the New Testament’s Greek gematria is laced with this problem. It is an inescapable part of Old World religions. We see it boldly displayed even in the image of the East Fork Works. Notice the small circle at the top has a diameter of 132 feet. The small square at the bottom has sides 132 by 110. If it were square, 132 x 132, it would be the square that can be circumscribed around the circle. They sneak it in again in a second place. At the top of the lamp is a curve that begins as if it has a radius of 584 feet or diameter of 1168 feet. If one were to complete the circle, the square that can be inscribed within it would have sides of 826 feet. From the top of the small square to the point is 825 feet (vs. 826 is a negligible error) or the side of the square required. This idea appears blatantly in the High Bank works where the circle is set almost next to a square that is beginning to distort into an octagon. The idea appears repetitively, as we shall see, in the Newark Earthworks. Scherz also brings up the topic of units. We will continue next with some modern day guesses as to the units used in pre-Columbus America. Michell, John, “The Dimensions of Paradise: Sacred Geometry, Ancient Science, and the Heavenly Order of the Earth,” Rochester, Vermont: Inner Traditions International, 2008. This entry was posted in American History, Ancient History, Mysteries, Religion, Science, Uncategorized and tagged Dimensions of Paradise, gematria, John Michell, Ohio Earthworks, Square inscribed in the circle, Square the circle.